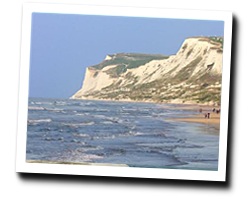 On the Opal Coast (Côte d'Opale), Wissant is a quiet and pretty village nestled in a natural site between the cliffs of Cap Blanc Nez and those of Cap Gris-Nez. Cap Gris-Nez is the point of the French coast closest to England. At the seaside you will find a large sandy beach, safe for young children. You can practice kite-surfing and windsurfing. In Wissant, enjoy a seaview holiday rental. 5 room apartment 130m2. Close to town centre. terrace. balcony. 4 Bedroom(s), short stays possibility. 3 rooms Apartment 60 m2. Balcony. Distance to the sea: 10 m. Nice view of the sea and the beach. Direct access to the sandy beach. 2 Bedroom(s), 1 double bed(s). short stays possibility. 3 rooms apartment 50sq. m 20m from the beach. balcony. 2 Bedroom(s), 1 double bed(s). short stays possibility. Final cleaning : 30 €. 3 rooms apartment 60m2. Close to the beach. terrace. House with a sea view. Balcony with a sea view. Courtyard on the back with garden furniture and deck chairs. Private parking. 1 Bedroom(s), 2 double bed(s). short stays possibility. Ideally located on seawall with views of the sea, Cape white nose and England. Apartment in Villa located at the end of a quiet dead end. 3 Bedroom(s), 3 double bed(s). Studio de la Digue is a modern studio located just 40 meters from the sea in Wissant and 16 km from the center of Calais. The studio's furnished balcony offers a view of the sea. 1 Bedroom(s), 1 double bed(s). short stays possibility. Final cleaning : 35 €. Spacious apartment in a residence built in the 70s and completely renovated and modernized in 2012. Large private balcony overlooking the sea and the beautiful sandy beach of Wissant.